I promise you. I have been running. But I evidently haven't run a race since May. Happy to report though, that all changed yesterday. My running chicas and I ran the Chick-fil-A Moo've It 5K. This is a back-to-school favorite in our county primarily because the proceeds from the race are given back to the schools via our local education foundation and a school zone participation competition. A competition the zone I work in and which my children attend won! I am the second person from the left. 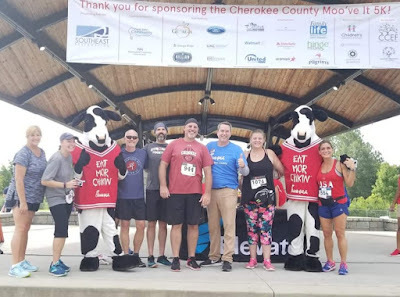 Go Cherokee Zone! The race was packed with people, and one thing is certain: the Chick-fil-A 5K has outgrown this venue - a local park. When you've got individuals parking along side the road just to get into the park to race, you know you've got a problem. Additionally, the race itself had a bit of a hiccup. 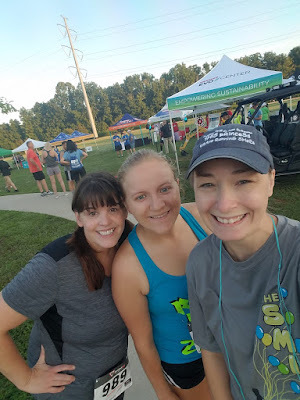 Before crossing over a bridge to continue running the 5K, there is a loop that needs to be completed. 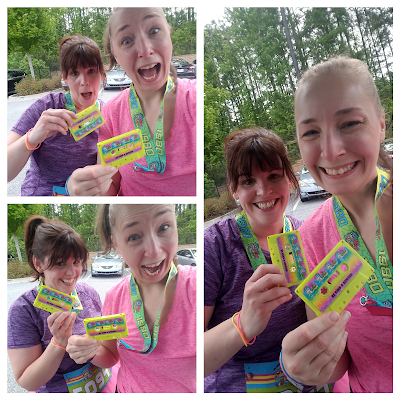 Sadly though, the front runners of the race had a hard time completing that loop because they ran into the other half of the race's runners still trying to complete the loop before they could cross the bridge. I can only imagine that traffic jam was a huge frustration to them. Also, something went wrong with the chip timing on the bibs which may have been due to the massive amount of people that attempted to run that day. 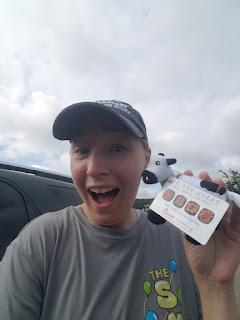 I know this for a couple reasons including the fact that they announced me as a third place winner in my age group with a race time of 25 minutes when in reality my time was just under 45 minutes that day. OMG! I do not deserve this! 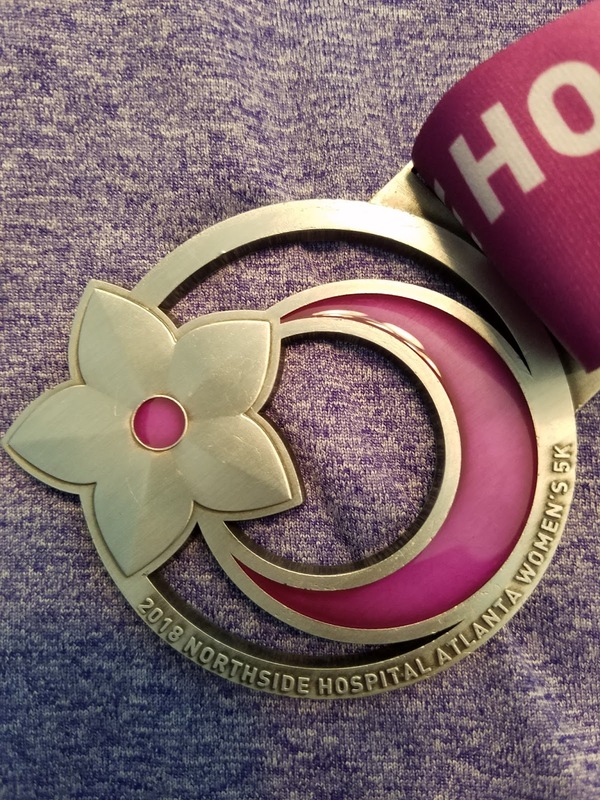 Despite the chaos, it was a good run for a good cause. 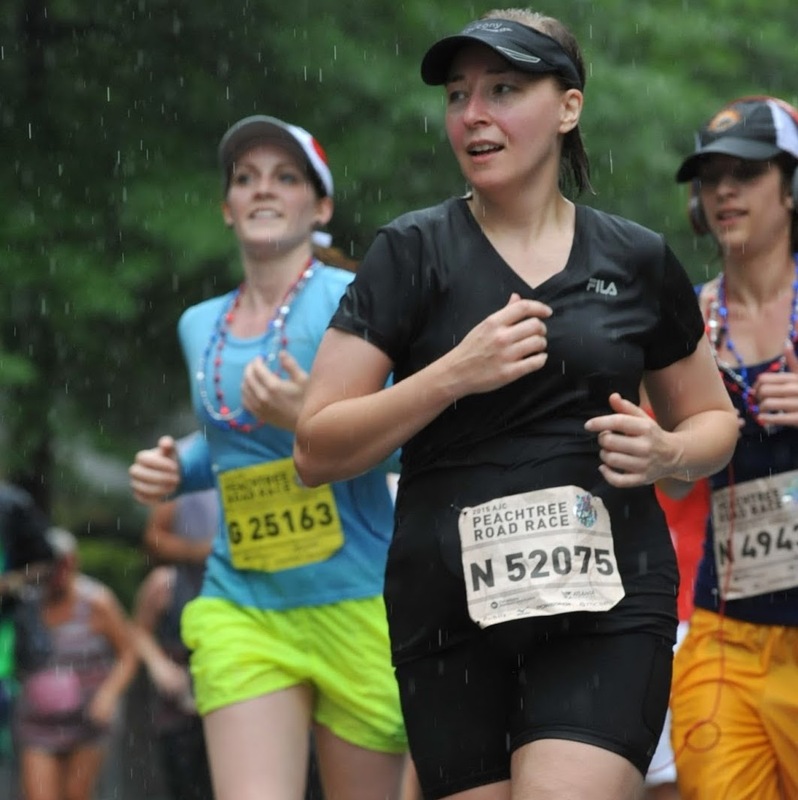 The August heat is a good reason to not run this race again. However, the atmosphere is one of support for our public school system, and that uplifting spirit is a big reason for this teacher to consider running it again - as I did two years ago. 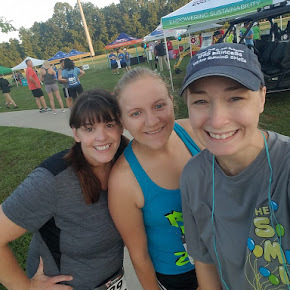 I am going to try to run at least one race each month going forward. I don't have any definite running goals as of right now other than just run. Well, run, and enjoy running. Running is a gift too few know the pleasure of unwrapping. Posted by Unknown on August 12, 2018 No comments as of yet. Please leave yours! 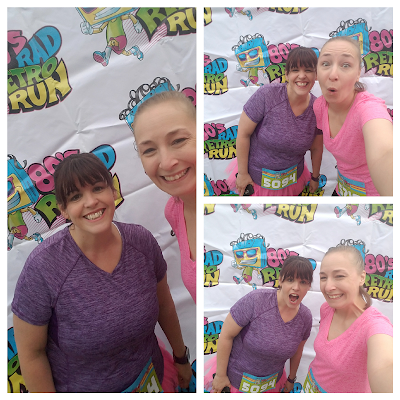 Last weekend, my bestest running buddy and I ran the 80's Rad Retro Run. We were just two chicas looking to exercise, have fun, and be silly. 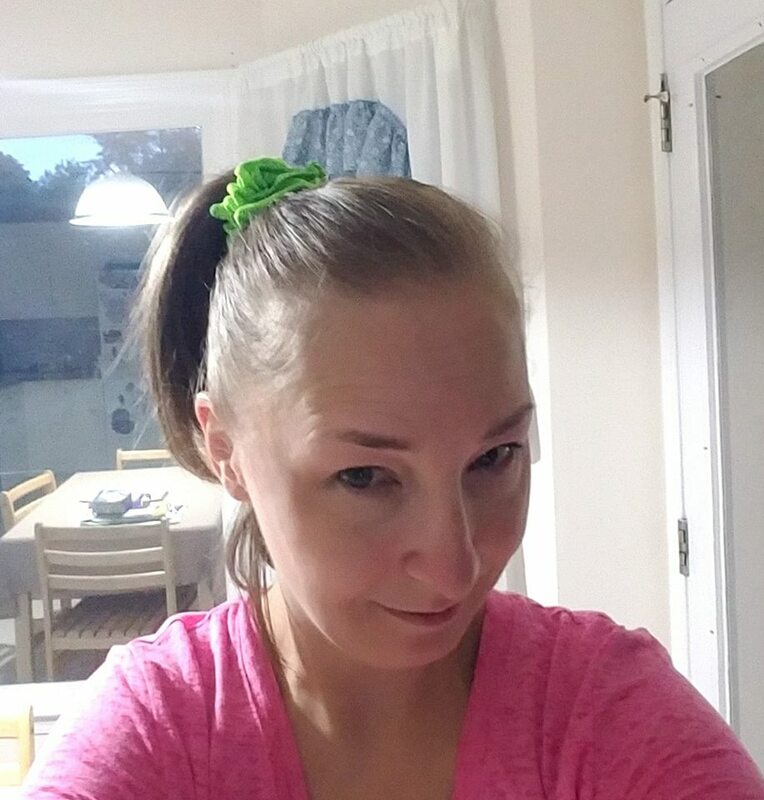 80s scrunchie on and ready to go! Posted by Unknown on May 11, 2018 No comments as of yet. Please leave yours! 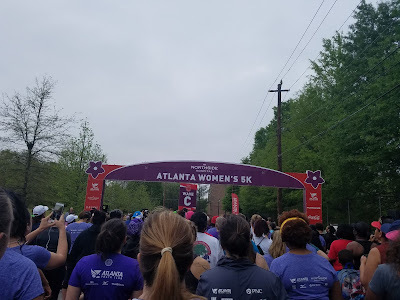 April 14th, I got to run the largest 5K in the Southeast: The Atlanta Women's 5K. Although I was bummed that none of my regular running chicas could experience this with me, I was excited to be running in this event. I had heard a lot about it, and the race certainly did live up to all the hype. The atmosphere was electric with female pheromones! Music, set to a perfect tempo to excite runners, greeted me upon arrival, and after checking in and getting my bib, there were vendors to enjoy, tempting me to shop. Before the race got started, we were given an opportunity to participate in a group stretch, which I thoroughly enjoyed. 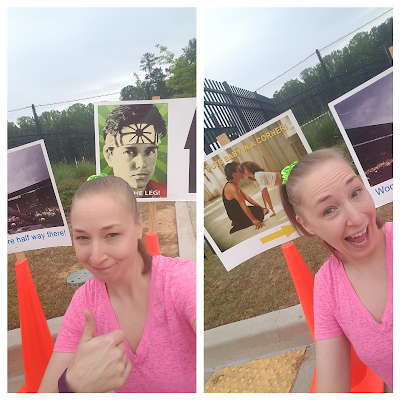 Then, runners were told to move to their race corrals. Do you see the purple flowers on the race banner in the above pic? These emblems were everywhere. 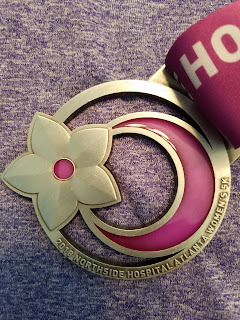 The medals were shaped like this flower, and I couldn't help thinking they looked a lot like purple forget-me-nots. Now, if you have read my blog in between 2010 and 2016, you know that it used to be titled Forget-me-not, Oh Lord! And you know why those flowers are special to me. Whenever I see them, or anything that reminds me of them, I think about the baby I lost back in August of 2010, our Angel. 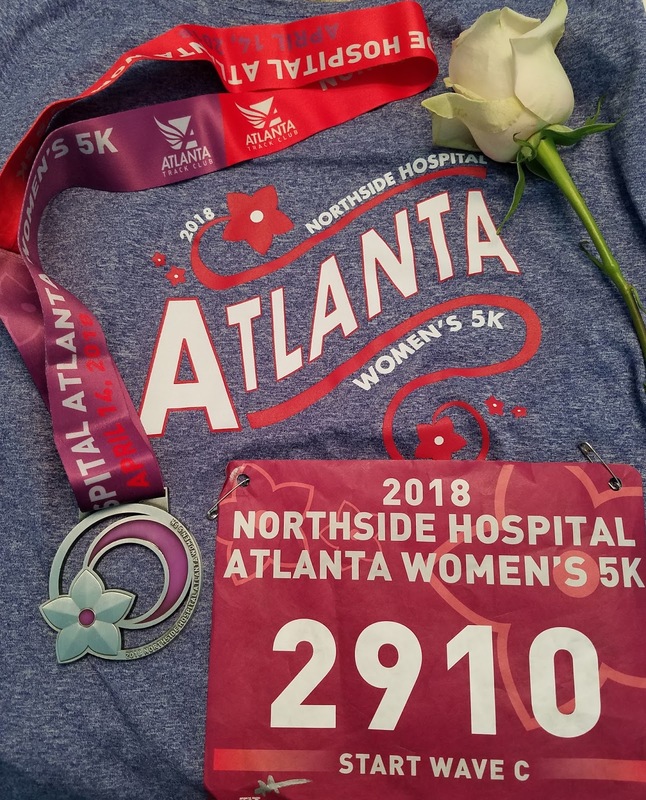 Waiting for the race to start, I thought about the day of my miscarriage, and looking around at the hundreds of women that surrounded me that day, I thought of the reality that 1 in 4 women will experience a miscarriage in their lifetime. I wondered which of these ladies had at one point shared in the pain I had experienced eight years ago. And then the race started. And I ran. And thoughts of Angel ran with me, thoughts of all that I had done since then to honor her memory, thoughts of the races run for her. To think of her now, makes me smile. Back then, to think of her would bring unimaginable sadness. But it is somewhat true what they say, "Time heals all wounds." So now when I think of her, I smile. I'm grateful to have carried her the few weeks I did. I'm a better person for having had her in my life. So I ran. Happy. Determined to remain happy. And it was a good race. 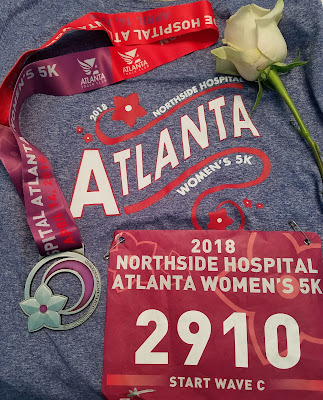 After finishing, I got a medal, my shirt, and a flower! We were showered with gifts!! I had a great time enjoying me and remembering Angel. This race is a keeper, for sure! Posted by Unknown on April 27, 2018 No comments as of yet. Please leave yours!